1. the experience of siva is central to the objective of yoga. siva is described as ‘sat-chit-ananda’, meaning experience of bliss as final truth of the eternal yogi within us. siva is the ‘holy ghost’, the eternally awake soul that knows and is the source as spirit. becoming one as spirit in the body is the yogic union. 2. walk sometimes barefoot outdoor. we are made of the five elements and our foot as body touching mother earth reminds us of our sacred connection as one in the basic element. the process of walking barefoot stimulates all the vital nadis that represent the entire body on sole of our foot. 3. whenever we are sad or depressed, visualize the factors effecting us as a witness instead of the experiencer. we could utilize these feelings for a deeper meditative journey. have you noticed that it is more difficult to quiten the mind when we are excited than when we are sad? a spiritual being has a more intense single pointed depression and often deeper worry for no apparent reason. recognizing that this depression or sadness is craving for the sacred pleasure of divine union is a yogic procedure. rumi would sing, ‘let sorrows and pains carve my cup deeper and wider so to could hold more’. it is like a little child crying for milk and the mother comes and give the baby milk. the baby is joyful not only for the milk received but also especially for the mother’s warmth and physical presence. our meditative yogic union is similar- we utilize of emotional ‘hunger’ and deep heart’s need to cry for its divine intervention and in our yogic union, as we feel the fear dissolving joy rise as the sacred presence within us as our divine self the moment our mind is dissolved in the surrender. 4.while doing each yoga asana, be conscious of the energies opening up through the ida, moon and pingala channels. a. create the mulabandha lock in your inhale. b.let the mulabandha ignite the lamp that grows upward with each inhale. c. exhale slowly through the side of the spine of the right side through the yoga sequence while working on the right side of the body and vice versa, exhale the left side. each side a couple of times till the mind is centered. this balancing of energies of the moon and sun as breath helps bring the harmonious union within as our yoga. we are in effect doing a ‘nadi-shudi’, a gentle cleansing of the thousands of energy points in our body, called the ‘nadis’. this is in preparation as the foundation for awakening the kundalini fire. we attain a sense of balance and center easily as awareness and balancing of the twin energies of breath. 5. think of our yogic journey as peeling up of an onion. the external layers are the body, then the emotions, then the thought process, then the knowing, then utilizing this knowing to absorb of five senses and then the journey to the eternal as dissolving our body and thought to the grace of the divine that is within the fire elements- earth, water, fire, air and space. to know the element of space is to enjoy the supreme ecstasy as the dancer and the dance of wisdom in the oneness. 6. strengthen the lower back and choose asanas, yogis postures that are specific to this region of the body. strength built here holds the foundation above youthfully rejuvenated. a strong lower trunk allows the yogi/yogini to hold the yogic fire of the muladhara, the base chakra thought out our conscious wakeful moments. this perpetual fire within firms up the body and the ascending energies enable rapid rejuvenative energies throughout the body. Raise your Consciousness with Turiya Nada – Cave of the Siddhars: Conscious Multimedia Database applies Dr. David Hawkins’ revolutionary conscious calibrations through the use of applied kinesiology. According to Dr. Hawkins’ Map of Consciousness, Cave of the Siddhars calibrates in between 1000 and 1250. This is the level of Christ, Buddhahood, Krishna and Brahman. 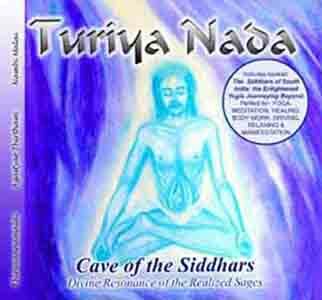 Out of over 250Cds featured by cmmdb.com , Turiya Nada "Cave of the Siddhars" is featured the highest. Ideal music for yoga, meditation, healing, body work , driving or simply, celebrating life! Experience this pure, delightful, transforming music!! !